Of all the material types for a roof, a liquid roof coating is perhaps the oddest. It has multiple values, several material options and is definitely worth a more in-depth look. Before the mid 20th century, liquid roof existed, but in an entirely different way than today. It used to be bitumen (think mortar) mixed with fillers, such as sand, straw, and later felt paper. The one caveat was that bitumen needed to be applied hot. Piping hot, so as to form a liquid that could spread evenly. — And dangerously hot, because at times fires would occur. That’s not good, but it was the norm, until around 1960. From 1960 to present, there are a wide range of materials such as acrylics, EPDM, asphalt and polyester urethanes. The technical names and variations are numerous while liquid EPDM is arguably the most popular, though competition certainly exists. A key difference is all these new age materials are applied cold, meaning there is zero need to heat them, in order to spread the material on the roof deck. They act as a membrane, which encapsulates the roof with a waterproof layer, and protects what’s underneath. A liquid roof coating is otherwise known as sealing or spraying on a roof over the existing low-slope roofing system. For residential properties, it is likely the roof deck already has some former material on the home that has some known problem, i.e. is leaking or water is pooling up. So, the cost question is what’s the price to seal the roof? And the answer is, it will vary. — It will depend on what the material is that’s being sealed (or whether it ought to be removed, or just cleaned), what the new material will be, the actual slope of the roof, and the experience along with guarantees the applicator is able to provide. 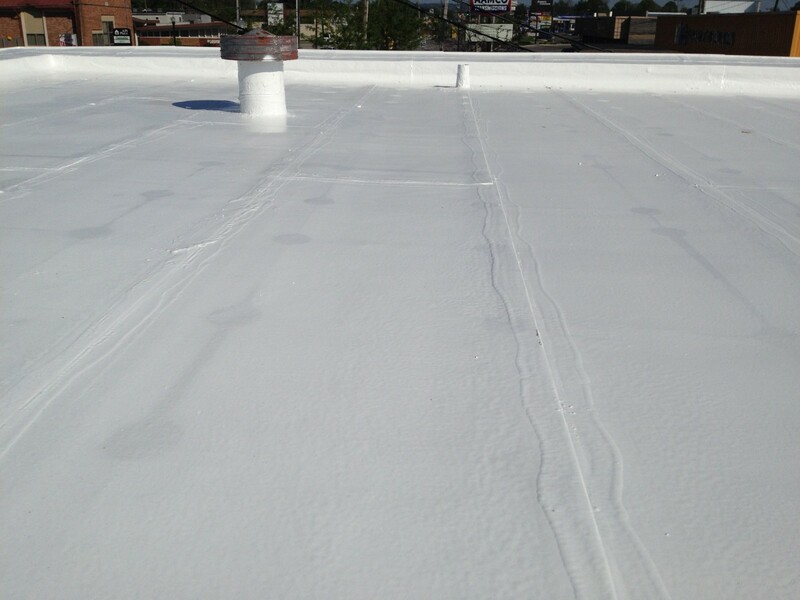 A fair ball park for a low-end application can be as low as $1,200 for liquid roof coating of an entire roof deck. Possibly as low as $500, and lower if going the DIY route, which for the inexperienced has its obvious drawbacks. More than $1,000 would be extraordinary, but possible if there is more to the job than just adhering the liquid membrane on a flat roof with little to nothing penetrating from the roof. — Please note that the above prices reflect the cost of hiring a handyman to do the job. If you decide to hire a professional roofing company that will pull the building permit for the job, do everything by the book and stand behind its work, then your cost will likely be a few thousand dollars to have a liquid roof coating professionally applied to a typical residential flat or low-slope roof. The cost of applying a polyurethane foam coating can be as little as $3 per square foot. The cost of acrylic coating will be between $5 to $6 per square foot. Silicon is the agreed upon premier spray application, but the material costs can drive installation prices up to $9-$10 per square foot or more. With value, we are looking to communicate return on investment (ROI). In our advantages section below, we present the positive values that come from such a roofing application. ROI will depend on material chosen and quality of application. In general, 10 years of quality sealing ought to be expected. Less than that would be poor application and amount to bad ROI. With an energy-efficient, liquid-roof coating, the entire roof can be coated with a reflective material, which can make your roof more energy efficient and longer-lasting. There are many liquid roof products on the market averaging roughly $100 for a 4.75 gallon container. A typical container can be used to cover approximately 250 square feet of roofing surface. 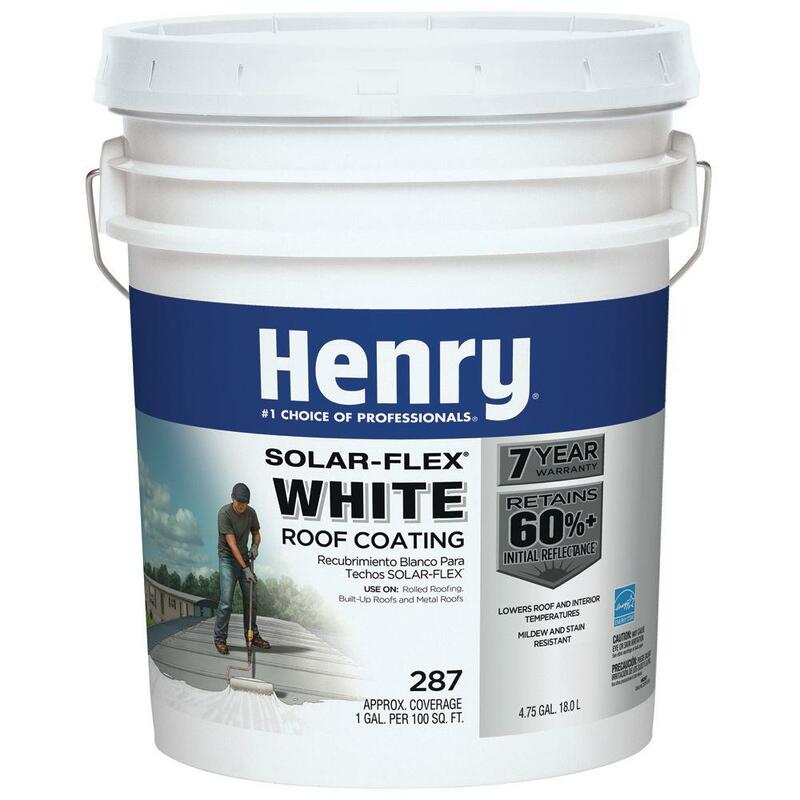 If you would like to have your entire roof coated, you can buy a pallet containing sixteen 4.75 gallon containers of liquid roof product such as Henry Solar-Flex White Roof Coating for about a thousand dollars at Home Depot. A typical job of professionally applying a liquid roof coating on low slope roof will likely cost a few thousand dollars for a typical residential project. Is the cost of applying a reflective roof coating a good investment? *Coatings are considered “restoration” and not a new roof system installation. Therefore they may usually be expensed in the fiscal year during which they are applied instead of amortizing the cost over the life of the roof (as in a new membrane installation). — This can be a significant tax benefit to some building owners. Check with your CPA or CFO to properly apply this information to your own roof situation. Is a special contractor required to install a reflective roof coating? An experienced roofing contractor should apply the reflective roof coating. Although the coating may look like ordinary architectural coating, successful application and long-term performance requires proper preparation, repair of leaks or damaged areas, and ultimately proper selection of the correct primer and coating system. Or more like part 2 of the understanding the material, as there is much we didn’t touch on that we now will. Synthetic roof membranes are usually applied in one of two ways. They are either mechanically attached via screws or nails or they are adhered via gluing. Liquid roof coating is the second method, but bypasses the need for applying the roofing material with additional glue. So, a major advantage of liquid roof coating is that it truly provides a monolithic roof coating. This means no seams. Seams mean water, and other weather elements, have a place to enter the upper most layer of a home and seep in. Liquid roof coating prevents that. With flat roofs, which aren’t technically flat, but close enough, an ongoing issue is pooling of water on the roof deck. A quality installation on a flat roof will minimize any chances for pooling water. Yet, there are going to be elements, including humans walking on the roof, that impact the roof surface, leaving indentations of some sort. A liquid roof coating, in today’s market, uses materials that actively resist water pooling. Thus, being designed to withstand standing or pooling water including freeze and thaw cycles is another important advantage of liquid roof coatings. Even if indentations happen over time, which they surely will, the lack of seams leaves it as rather impossible for the water/elements to seep below the surface. The more well known advantage is that liquid coatings provide the cool roof value. Typically a white roof will reflect UV rays. And while any color can be used for liquid roofing, white, gray and black are the popular options. Asphalt liquid roofs can achieve an aluminum color, which is perhaps the most reflective. This means hot air stays outside, and cooler temps staying inside, which for energy efficiency in warmer climates is desired. Another unique advantage is the slow cure time, or the time it takes for the liquid material to fully adhere and harden on the roof deck. At first glance, this may seem like a disadvantage, until you realize that even when wet, the material provides a waterproof barrier. The real advantage here though is how this slow curing process compares to other materials. Typically, when a roofing job is done, and especially with membrane type roofs, there is air trapped between the material and what’s underneath (the substrate). With a slow cure, the crevices are being slowly filled with the material, thus more evenly applied when curing is finished. With a fast cure, which is the norm for other materials, the crevices of air provide uneven finishes that are more prone to indentation, particularly from hard rains or hail. These are rather few, but there are some disadvantages of liquid roofs. Mostly due to lack of proper installation, which at times even a pro is subject to. It is vital for proper curing that the material the liquid roofing is being applied to be clean and dry. If it is not, the material will still work, but will adhere differently in certain areas. The material is also rather new, so warranties longer than 10 years are reason to be skeptical. If from an established company, then less reason to be skeptical. If from a new company boasting long warranty, then take it with a grain of salt, or pay the possibly higher rate from the more established company. Depending on the material, over time it may get brittle and break. Re-coating is generally the reasonable solution here, but this takes inspections. While there is no routine maintenance that is needed, there is reason for routine inspections. Membranes are usually applied in depths measured by the millimeter. For liquid coatings, 15 to 20 millimeters is typical, though can be more if the material calls for it, or the professional roofer feels it necessary to fulfill the warranty. Even though the material has significant advantage of being without seams, it does have disadvantage of not being a great insulator, like other roofing materials. But this is for a coating, and not meant to be the primary material of a roofing system.